On a beautiful afternoon during Memorial Day weekend, the Utah Capitol steps were filled with a strange mix of conservatives and liberals, farmers, students, hipsters and folks wearing Guy Fawkes masks. As many as 400 concerned citizens had taken a day out of their holiday weekend to make some noise in opposition to biotech-seed-patenting goliath Monsanto. The driving force behind this gathering, as well as global rallies in more than 50 countries and more than 400 cities in the United States, is Tami Canal, a cheery, 31-year-old stay-at-home mom from Farmington. 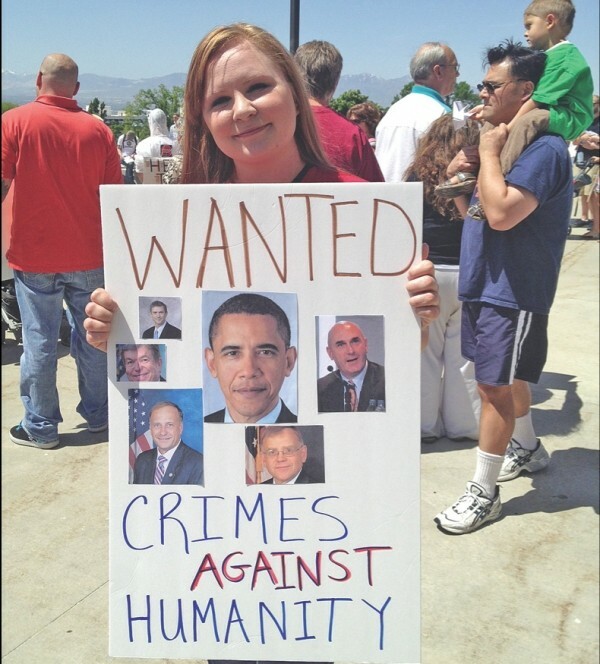 Though Canal isn’t the main speaker at the Utah event she kicked off, she happily walks through the crowd with her poster-board sign, which lists President Barack Obama and others as being wanted for crimes against humanity. After finishing an interview with a reporter, Canal asks when the publication will come out so she can cut the article out for a scrapbook she’s making for her two children. It’s Canal’s motherly inclinations that helped her launch the March Against Monsanto protest, which had collected more than 150,000 likes on Facebook at the time of publication. Canal says she’s never taken part in activism like this before, but says that when it comes to the food her children eat, it didn’t take much for her to get involved. “As a mom, I really want to inform other parents because I feel it’s our obligation to raise a healthy generation,” Canal says. Canal says she’s blown away by how viral the movement has become. Now, she’s helping to channel the momentum of the event into ongoing rallies and efforts against Monsanto, the multi-billion-dollar agricultural biotech company whose genetically engineered crops have a major impact on the food products the world eats. Activists have made plenty of noise about the company and its products, raising alarms over the correlation between a rise in autism and the proliferation of GMOs—genetically modified organisms—in the food market. A French researcher released a study in a peer-reviewed journal that showed that rats that were fed GMO corn had an increase in cancerous tumors. Numerous researchers challenged the methodology of the study as biased and faulty, however. Monsanto company spokesman Thomas Helscher responded to City Weekly via e-mail and pointed out that no credible links have been established with GMOS and autism and noted that the French study was denounced by many, including France’s six scientific academies. Canal, worries, however, that though the scientific jury is still out on GMOs, they’re common in food products—something most consumers aren’t aware of. Canal was a California resident in fall 2012, when Ballot Proposition 37 was defeated in a close race. The proposition would have required food containing GMOs be labeled as such. Companies like Monsanto poured millions into the election, helping defeat the proposition, which gained 47 percent of the vote. “That’s where my rage started,” Canal says. The company’s use of neonicotinoid pesticides on its crops has been challenged by numerous studies—including researchers with the Harvard School of Public Health—who argue that the pesticides imperil bee populations, which, in the long term, could jeopardize the global food supply. In April 2013, the European Union voted to ban pesticide use for two years on crops that could attract honeybees. Helscher points out that United States agencies have published findings saying research on the impact of pesticides is not conclusive. Canal says the movement she helped launch that brought thousands out across the world is one organized around an issue that affects all, and implicates politicians of both parties. In March, President Barack Obama signed the Agricultural Appropriations Bill into law that had wording in it, largely unnoticed by numerous members of Congress, that would allow Monsanto to plant genetically modified crops, even if a court ordered them not to. The bill has been dubbed the “Monsanto Protection Act” by critics. Canal says the opposition movement has found a unique cross-section of support because the issue affects so many people and because so many politicians, liberals and conservatives both, have supported Monsanto. “We have anarchists, we got Christians ... people from all walks of life, all political backgrounds, have put aside the partisan crap and have really joined together because this is such a big issue that affects everyone,” Canal says. Even while the politics of challenging Monsanto seem intimidating, activists at the rally emphasized the literal grass-roots approach that comes from simple acts of resistance, like growing a garden. “You try to work within the system, but realistically, it’s only something like this that gets people’s attention,” activist Aaron Davis says of the rally. Canal says the movement she started is going to continue raising awareness. The group has joined with Moms Across America and plans to be a force in Fourth of July parades, trying to raise awareness, and that the group will also be rallying on World Food Day on Oct. 16.